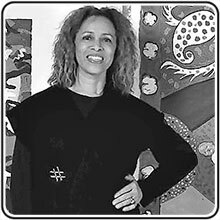 Painter, printmaker, and weaver Emma Amos was born in 1938 and grew up in Atlanta, Georgia. She attended the five-year program at Antioch University in Yellow Springs, Ohio and spent her fourth year abroad at the London Central School of Art, studying printmaking, painting, and weaving. She received a BA from Antioch, and thenshe returned to the Central School to earn a diploma in etching in 1960. She earned her MA from New York University in 1965. Amos’s first solo exhibition was in an Atlanta gallery in 1960. During her time at New York University Hale Woodruff invited her to become a member of Spiral, a group of black artists that included Romare Bearden, Norman Lewis, and Charles Alston. She was the group’s youngest and only female member. In 1974 she began teaching at the Newark School of Fine and Industrial Arts, and in 1977 she developed and cohosted with Beth Gutcheon Show of Hands, a crafts show for WGBH Educational TV in Boston, which ran for two years. In 1980, Amos became an assistant professor at the Mason Gross School of Art, Rutgers University. She served as chair of the department from 2005 to 2007 and retired in 2008 as Professor II. She is a member of the National Academy Museum and a Governor of Skowhegan. Amos’s work has been exhibited internationally and is included in the collections of the Museum of Modern Art, Birmingham Museum, the Wadsworth Atheneum, the Morris Museum, the New Jersey and Minnesota state museums, and the Dade County and Newark museums, and many others. She has been awarded numerous grants including a Pollock-Krasner Foundation Grant, a Rockefeller residency in Bellagio, A New York Foundation for the Arts Fellowship in Painting, a NEA Fellowship in Drawing, A Lifetime Achievement Award from the Women Caucus of Art among others, and a Civitella Ranieri Foundation Residency in Italy in the upcoming Fall 2013.